The title page of the Shakespeare First Folio, published in 1623, features an engraving of William Shakespeare by Martin Droeshout. Image courtesy of the Folger Shakespeare Library. Emory University has been chosen as the Georgia site for display of "First Folio! The Book that Gave Us Shakespeare," a national traveling exhibition of the Shakespeare First Folio, one of the world's most treasured books. The Folger Shakespeare Library, in partnership with Cincinnati Museum Center and the American Library Association, is touring a First Folio of Shakespeare in 2016 to all 50 states, Washington, D.C., and Puerto Rico. The First Folio comes to Emory through a combined effort of the university, the Manuscript, Archives and Rare Book Library, the World Shakespeare Project, and the Michael C. Carlos Museum, where the exhibit will be on display. Planning is currently underway for numerous programs for the public and families around the First Folio exhibition. Dates for the exhibition tour, including its time at Emory, will be announced in April. "This is an extraordinary opportunity for Emory, MARBL, the Woodruff Library and the Carlos Museum to focus on the strengths of our shared literary and cultural collections," says Rosemary Magee, director of MARBL. Emory programming around the First Folio exhibit will include public workshops, lectures, panel discussions and artistic installations. "Students, scholars, teachers and the broader community throughout Georgia will come face-to-face with works of great achievement that continue to transform our sense of ourselves," Magee says. The First Folio at Emory also exemplifies the university's focus on helping students engage with the nature of evidence, Magee notes, empowering them to be independent thinkers capable of supporting arguments with different types of artistic and historical evidence. The First Folio is the first collected edition of William Shakespeare’s plays. It was published in 1623, seven years after Shakespeare’s death. Many of Shakespeare's plays, which were written to be performed, were not published during his lifetime. Two of Shakespeare’s fellow actors compiled 36 of his plays, hoping to preserve them for future generations. Without the First Folio, we would not have 18 of Shakespeare’s plays, including "Macbeth," "Julius Caesar," "Twelfth Night," "The Tempest," "Antony and Cleopatra," "The Comedy of Errors" and "As You Like It." All 18 appear for the first time in print in the First Folio. The Folger Shakespeare Library holds 82 copies of the First Folio, by far the largest collection in the world and more than a third of the 233 known copies in the world today. Researchers believe that about 750 copies were originally printed. 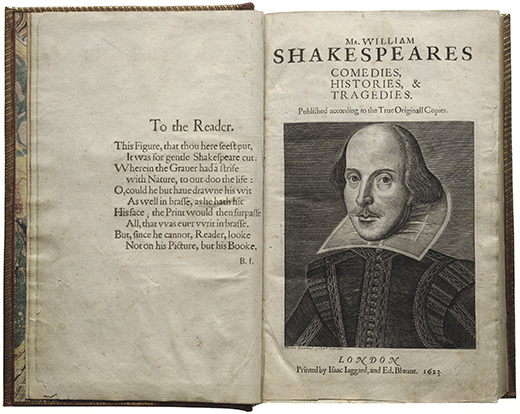 One of the most valuable printed books in the world, a First Folio sold for $6.2 million in 2001 at Christie’s and another one for $5.2 million in 2006 in London. It originally sold for one British pound (20 shillings)—about $200 today. The Folger, with the American Library Association and Cincinnati Museum Center, reviewed hundreds of potential applicant sites to host the First Folio before making the final selection. All were required to meet specific environmental and security requirements. When the First Folio arrives at Emory, its pages will be opened to the most quoted line from Shakespeare and one of the most quoted lines in the world, “to be or not to be” from "Hamlet." Accompanying the rare book will be a multi-panel exhibition exploring the significance of Shakespeare, then and now, with additional digital content and interactive activities. “First Folio! The Book that Gave Us Shakespeare” has been made possible in part by a major grant from the National Endowment for the Humanities: Exploring the human endeavor, and by the generous support of Google.org and Vinton and Sigrid Cerf. Learn more at www.folger.edu.